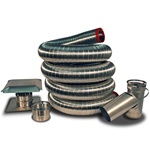 Chimney liners is often the most practical and affordable way to repair a damaged chimney. Chimneys can damage from a number of things such as settling, hurricanes and lightning. However, the most common form of chimney damage is a chimney fire. In addition to chimney damage, older liners may deteriorate. Additionally, there may not be a liner in there at all! Repair damage to the chimney, which could occur by a chimney fire, lightning strike, or settling, etc. Upgrade old chimneys without chimney liners. Replace worn, deteriorated liners. This may be allowing smoke, creosote or condensation to seep through the chimney walls. Properly size the chimney for a new appliance. Prevent excessive creosote buildup (and risk of a chimney fire) when venting a woodstove through an existing fireplace. HeatShield® is a specially formula “Cerfractory®” sealant material that fixes chimney flue tiles that have cracks, gaps, or spalling damage. It restores the integrity of your chimney’s flue to vent hazardous flue gases from your home. It eliminates the dangers in your chimney caused by gaps, cracks and spalling for years to come. By using either the Joint Repair System or Resurfacing System, depending on the defects found, your chimney will be restored to its original peak level of safety and efficiency. View the HeatShield manufacturer’s website. This method of relining involves installing a round or oval stainless steel liner in the chimney. The liner can be either rigid or flexible; flexible liners are for chimneys with offsets. Stainless steel liners are mainly for wood and pellet stoves, fireplace inserts, furnace and water heaters and fireplace installations. American Chimney and Masonry offers UL Listed stainless steel lining systems that come with a manufacturer’s Lifetime Warranty. This method is similar to stainless steel, but the liner is of aluminum. Aluminum liners are for vent certain types of gas appliances. Note: Gas logs intended for installation in wood burning fireplaces may not be vented with aluminum liners. In many cases, especially when only water heaters are vented into masonry flues, the gas appliances are vented into oversized flues. This practice may cause serious condensation and performance problems. When relining your chimney with our aluminum liner, one of the industry’s thickest aluminum liners, you can reduce the condensation problems and improve the performance of the appliances. Used mainly in new construction, this method of relining may be suitable for short, straight chimneys. If you have any doubts about your chimney give us a call at 513-662-4600. If your chimney is in need of relining, we will recommend the most practical and economical method for your chimney. Our technicians have the experience to recommend and install the right liner for your home.